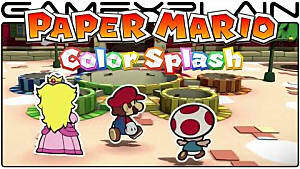 The Paper Mario series has come a long way since its debut on the Nintendo 64 back in 2001. What started as a creative take on the typical turn-based JRPG has gradually taken steps further and further away from its initial RPG formula, toward a radically different pseudo-RPG style of game that most people don't seem to be quite as fond of. 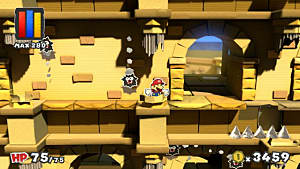 Ever since Super Paper Mario's release for the Wii in 2007, many people have been down on the Paper Mario series, saying that the last true installment was the last traditional turn-based RPG the series had -- the beloved Paper Mario: The Thousand-Year Door. While this isn't true for every fan of the series, the general majority seems to believe that the classic RPG times of the Paper Mario series, which at this point is the shorter period for the series, was it's heyday. But why is that? There are many JRPGs that gather devoted fanbases, whether it be large chunks of a whole series like Final Fantasy or one-hit wonders like Skies of Arcadia, so what makes the early Paper Mario games so special? What makes these two console RPGs starring Mario, the most well-known PLATFORMER hero of all time, stand out as such highly revered classics? We're going to approach both games simultaneously and systematically, in order to get to the general positive qualities of both titles before getting into the specifics. With that said, let's start with the biggest selling point of nearly every RPG of any kind -- the story. Something that, in Japan at least, the series was initially named for. The Story -- A familiar and yet far cry from typical Mario. 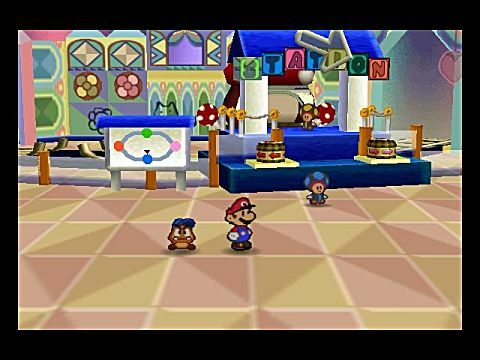 The general setup for both Paper Mario on the N64 as well as Paper Mario: The Thousand-Year Door are admittedly pretty typical for the Mario series, and nothing we haven't seen before... at the start, at least. While both installments do start with the classic standby of "the princess has been captured and you must save her", they both go off the rails into uncharted territory very quickly. While both games hit a lot of familiar notes by the standards of standard Mario plots, the stories told are notably deeper than their Platformer progenitors, and were clearly written with the intent to evoke both the emotional and the imaginative. This is evident in Intelligent Systems' signature excellent character banter and world building present throughout the games. From the NPCs, to your party members, to even the semi-mute Mario himself, every character is funny, helpful, or lends to world-building. 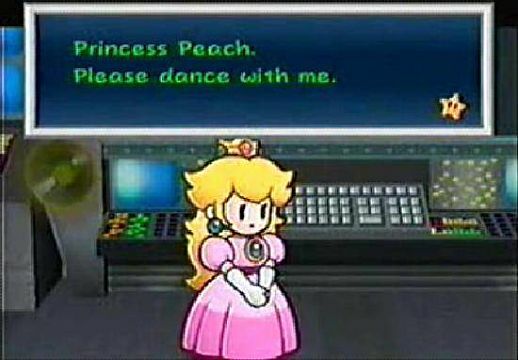 Princess Peach in particular is the probably the most fleshed out she's ever been in these two games. The audience gets to see her with a wide assortment of emotions, whether she's indignantly angry for being forced to cooperate with the enemy, being understanding of an inexperienced child, or shy as she attempts to explain the concept of love to a computer using personal experience. A subplot in The Thousand-Year Door that is both unexpected and surprisingly touching. Your party members were also all excellent characters. They all had their own motivations for joining Mario, vastly different personalities from one another, and perhaps the most intriguing part of all, they were all different types of enemies that Mario would usually fight. 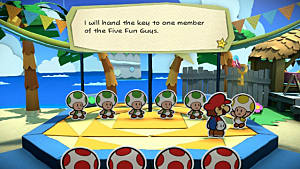 By having this jumbled crew of friendly monsters follow Mario throughout the game, the world felt even more immersive and real, as it showed that evil minions of Bowser were not all that the likes of Goombas and Koopas could be. These games took colorful cartoon monsters, most of whom aren't even close to human, and made them into likable and believable characters. The settings explored were also much more fleshed out and believable in these two RPGs than any traditional Mario Platformer could claim. 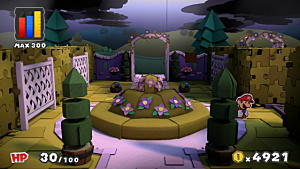 Even if in both games you explored the familiar grasslands, ice worlds, and castles, they were all far from just pallet swapped backgrounds with different colored enemies. 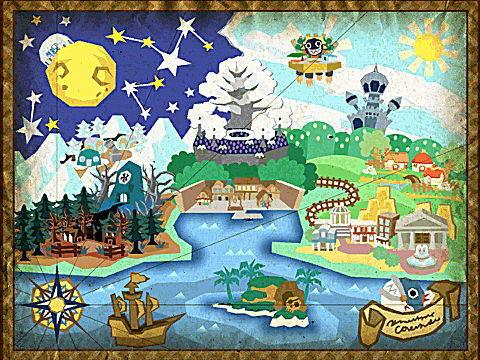 They were all far from the Mario norm, even if they felt familiar, and going to each new area felt like crossing over to a brand new continent. Every area in classic Paper Mario has a different story to tell. Whether it's the mysteries of the dirty dealings of the floating wrestling league the Glitz Pit, or the desert village of Boos who live in fear of being eaten, they all have a different tale to tell. The best thing that these different locations did for the games is how they subtly connected to each other, and gave the Mario universe a grander sense of scale and cohesiveness than it had ever had before. These locations coupled with these characters made the world feel truly alive, as you encountered tribes of insects living in giant trees, or a sleazy port-city full of criminals both Toad and enemy-monster alike. Not to mention they all looked and felt distinct and atmospheric as well. What other RPG let you travel around inside a magical toy box by train? The Combat -- Simple and easy to learn, yet still deep and involving. 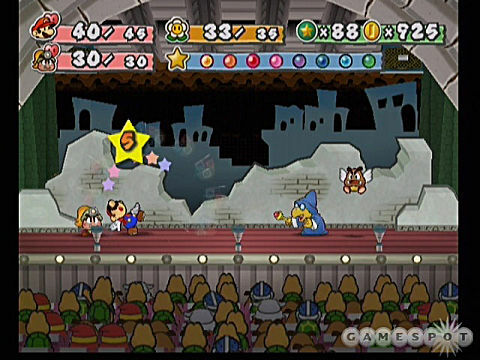 The first two Paper Mario games had a combat system unlike any other. Paper Mario built off of the strong foundation that Super Mario RPG laid down before it, and its combat reflects that fact more than anything. The use of timed hits during combat for both offense and defense allowed for actual tactile input during battles, which put more control into the player's hands and made the combat more than just strategy like most other turn-based games. 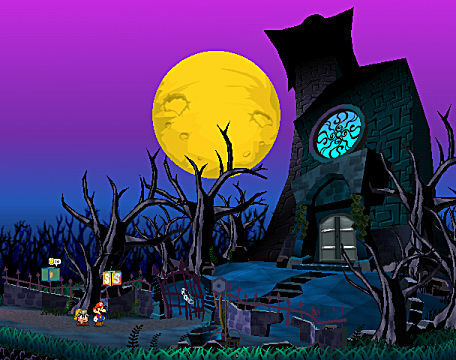 While the story and combat are the biggest aspects of the two games and obviously matter, and are themselves unique, the little things are what really make the early Paper Mario games so great because their immersive detail and sheer quantity allowed the world of Mario to feel the realest and most alive it ever has. 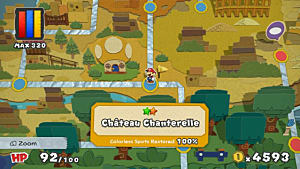 Additionally, something that made Paper Mario's turn-based combat so unique -- as well as easily accessible to beginners or newcomers -- was its use of smaller numbers. 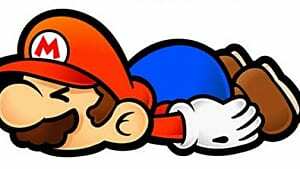 In most RPGs, you'll likely be going up against early-game bosses with a health bar in the hundreds or possibly thousands, but in Paper Mario, you'll be up against a first boss with 20 maximum health. This made keeping track of how much damage you were dealing the easy part, and made figuring out the specific weaknesses and strengths of a given enemy the real challenge. The combat also allowed for adaptive difficulty for players in the form the badge system. 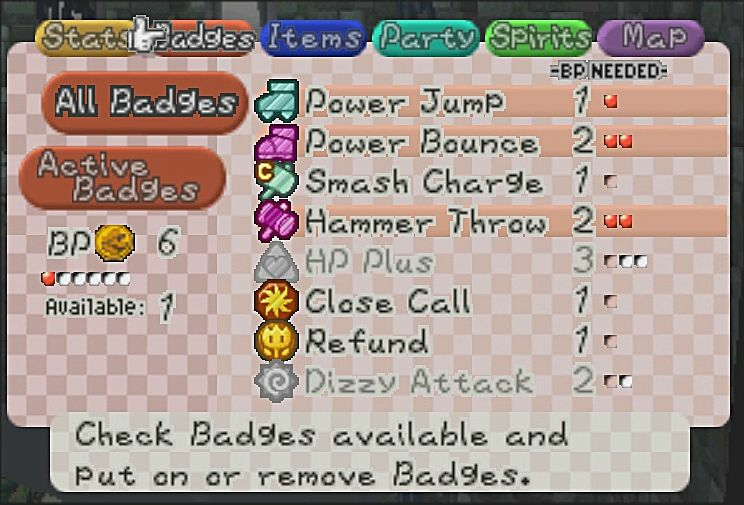 It allowed players to use their set number of Badge Points to equip badges that could aid them, or even handicap them, in both the overworld as well as combat. This allowed for players to customize their play-style in a way that suited the situation, or themselves, depending on what they wanted to improve, and on whether or not they wanted to make the game harder for themselves. This allowed for hundreds of level up strategies paired with badge combinations in any given playthrough, which created an enormous sense of player freedom, as well as replay value. Just one page of the badge collection screen. Dozens of badges; Hundreds of possibilities. Honestly, explaining what made both of these games good is a genuine challenge, as there are hundreds of tiny little details that are all integral to the experience, and all of them are legitimate reasons for both the games' intricate, multi-faceted, diamond-like quality. Everything from optional emails you could get from side quest characters, to the audience cheering you on as you battled, to the countless characters with punny names, it's ALL important. All of it. They're games whose beauty isn't really done justice by just a handful of words. 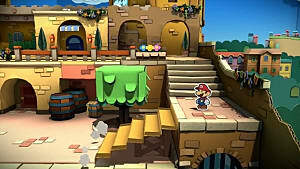 With Nintendo clearly veering the Paper Mario series away from its native satirical and anarchic style, towards a more casual and less challenging type of psuedo-RPG with the two most recent installments, it seems very likely that we will never see a game in the Paper Mario series quite like the first two ever again. 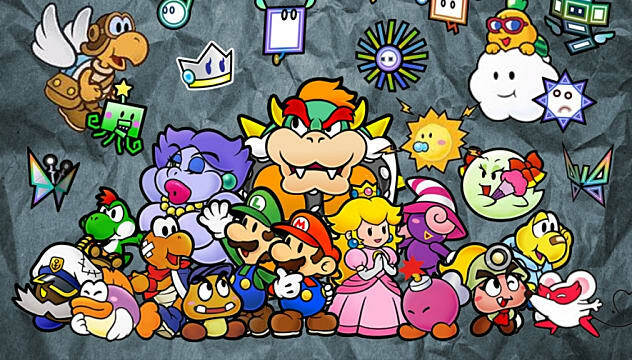 While that is a sad way of looking at things, it isn't necessarily a true, and we can all take comfort in the fact that no matter what changes the series goes through for better or worse, Paper Mario on the N64 and Paper Mario: The Thousand-Year Door will always be there. They exist in a joyous spin-off universe that no ret-con or prequel could ever truly lessen, no matter what they might do. 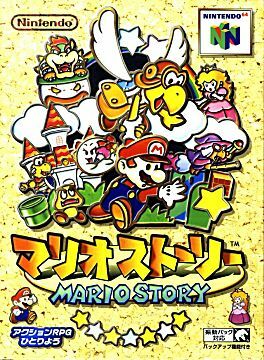 Even if you don't necessarily like where the series has gone since Super Paper Mario, and you think Nintendo should just go back to the original formula, at least there is one additional positive to a world where Paper Mario isn't a true RPG anymore. 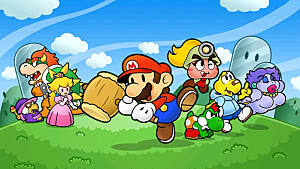 That being if Nintendo never quite matches the first two entries in terms of quality, that just makes Paper Mario and The Thousand-Year Door even better and more unique than they already are. 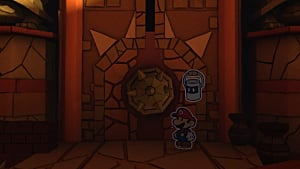 The simplest way to explain why Paper Mario on the N64 and Paper Mario: The Thousand-Year Door are great is that they feel rich and complete. They're paper thin, but far from two-dimensional. A picture is worth a thousand words. These games are both worth volumes.